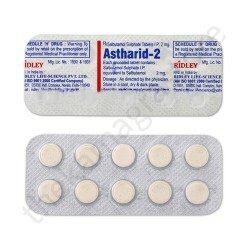 Astharid 2mg is a generic medicine with an active drug Salbutamol, one of the most frequently used asthma medicines. This medicine is prescribed for treating asthma and other chronic obstructive pulmonary disorders (COPDS) such as bronchitis and emphysema. It is also useful in preventing exercised-induced bronchospasm or asthma. It is indicated for asthma symptoms such as cough, shortness of breath, chest tightness and wheezing. It provides quick and short-term dilatation of airways in the lungs. It effectively manages asthma and other respiratory problems associated with symptoms such as chest tightness, wheezing, cough and breathing issues. Plus, it is a good remedy for people with asthma induced by physical activities or by exposure to allergens such as dust, pollutants and pollen. Astharid 2mg is ought to be taken orally and it will not act immediately after consuming the pill. It should not be utilized to relieve unexpected asthma attack. Your healthcare provider will advise you a rescue inhaler in such case while you are already undergoing treatment with Astharid 2mg. You need to follow all instructions while using Astharid 2mg. Take the pill by mouth at least three or four times, or as prescribed by your doctor. Usually, the dosage depends on the severity of the disease and your body’s response to the treatment. Regular use of this medicine will help you reap the benefits of the drug. Try to take the doses at same times each day so that you can prevent missing or skipping the dose. Take the dose immediately if you miss the dose, but do not take two doses to compensate the missed dose. Salbutamol, also called Albuterol, is the chief drug present in Astharid 2mg, which is the most broadly prescribed asthma medicine. This drug relaxes the muscles of the airways and opens up the bronchioles make air flow easy. This bronchodilation effect of Astharid 2mg helps you to breathe effortlessly. Prior to using Astharid 2mg, tell your doctor if you are sensitive to any medicinal drugs. Also, inform about the treatment you are undergoing with OTC or prescription medicines. Ask your doctor whether the medicine is safe in case if you have or have had medical problems related to brain, heart, liver or kidney. More importantly, talk to your doctor about using this asthma drug during pregnancy or breast-feeding. You may feel a bit drowsy after dosage, so avoid outdoors activities while undergoing treatment with Astharid 2mg. Tremor, nervousness, headache, drowsiness and restlessness are common and subside. If they do not subside, call your doctor right away. People using Astharid 2mg usually do not experience any serious side effects. However, call your doctor if you experience chest pain and skin rashes.